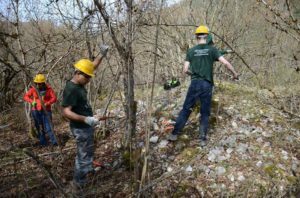 Saturday 13th and Sunday 14th April we are going to prune in Pettorano sul Gizio, in the Monte Genzana Alto Gizio Nature Reserve, for our project “Let’s take action for the bear”, which aims at recovering abandoned orchards in order to increase food sources for the Marsican brown bear outside built-up areas. Thanks to a grant from EOCA – European Outdoor Conservation Association, board and lodging for volunteers will be free. For information and participation, please write to info@salviamolorso.it. 7.45 pm – Dinner at a local restaurant. 3.00 pm – Return to Pettorano sul Gizio.